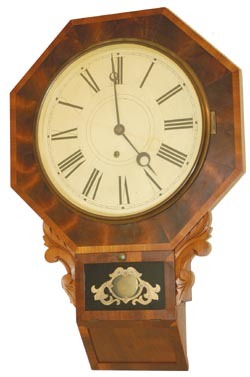 Waterbury Clock Company, wall clock, "Drop Octagon", C. 1875. This one is over 125 years old, but looks new inside and out. The only thing keeping it from being restored to perfection is some putty has fallen out of the bezel, and the little wood knob that locks the bezel to the case, is missing. Complete label, original glasses, bezel, and door. The side ears are probably replacements. I compared with pictures in the catalogs, trying to decide if they were original and cleaned like the rest of the case, or new carvings. I will lean on the side of not sure, and say they are new, but awfully doggone good. 8 day, time only. Ly- Waterbury #681.